The Golden Triangle of Art in Madrid is probably the most important concentration of museums of the world, alongside the Museums Island of Berlin. When you are asking yourself what to do while in Madrid, then taking in these museums is mandatory, making them the stand out of all the Spain Madrid Tours. 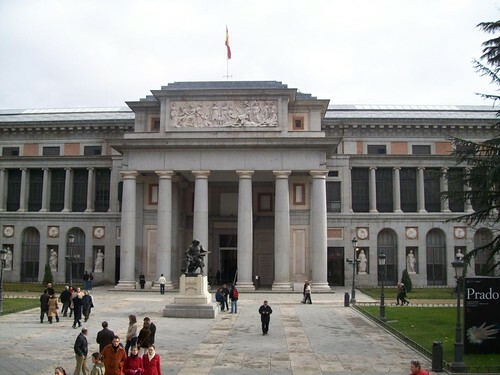 Making up the three focal points of the art triangle, are the galleries of the Prado Museum, the Reina-Sofia Museum and the Thyssen-Bornemisza Museum. Peripheral contemporary art buildings also located in the region include the Caixa Forum, The Madrid, the Naval Museum and the Mapfre Foundation. Containing not only masterpieces of art, but the Pablo, Reina and the Thyssen, complement each other’s collections beautifully. Let’s take a look at how. For the best in classic paintings, you get the Prado Museum. The contemporary painter Antonio Saura gave us the best definition of the Prado Museum: “the Prado is not the most extensive museum, but it’s the most intensive.” By that, Saura means that while the collection is not very complete, it does hold masterpieces. Showing only painting until the mid-19th century, it boasts such artists as Velazquez, Goya, El Greco, Murillo, Tiziano, and Rubens, to name a few. Part of what makes this collection so rich is that the Kings of Spain used to collect the best paintings. Picking up in the mid-19th century, this collection only contains modern paintings, masterpieces of the avant-garde variety. Some of the schools represented at the Reina are: Surrealism, Cubism, Dadaism, Expressionisms, and Abstraction. Touting some of their best works of are here, include: Salvador Dali, Max Enst, Juan Gris, and Francis Bacon. However, the best work in this gallery is the “Guernixa”, by Pablo Picasso, a must see on all Spain Madrid Tours. Showing the moment in which the basque town of Guernica suffers the bombing that ruined the village in 1937 during the Spanish Civil war, it tells the world the horrors of war. Beyond “Guernica”, the Reina-Sofia is home to other Picasso works such as “Lady in Blue,” created in his youth period. Portraits of violins, guitars and other instruments are also included. The Thyssen Museum gets its encyclopedic description because of the way its organized-in a didactic way. The first rooms start with the oldest schools continuing into the last rooms, which display the more modern painters. Originally a private collection put together by Hans Heinrich von Thysses-Bornemisza, he tried to make a complete collection that was the whole History of Art. He was able to include: Gothic, Renaissance, Baroque, Neoclassicism, Impressionism, Cubism, Surrealism and other important schools. The main periods of the History of Art are present in this museum. It became available for public viewing when the Spanish government bought the heart of the collection in 1993, displaying it in the Villahermosa Palace, right in front of the Pablo Museum. Connecting the dots of the three points of each museum, the Triangle of Art forms perfectly to fill in gaps the other is missing. In doing so it contains the whole History of Art. It’s easy to see why you should include these sites in your Madrid Tours. Contact us to help you organize a very special tour of this area. We can make it very flexible!